SUMMARY: A Cinderella retelling. Gisela is her stepmother's prisoner. Forced to work as a servant in her own home, Gisela has plans to leave and dreams of marrying the Duke's handsome son one day. Valten, of course, doesn't remember her. And he is way out of her reach anyway--how could he ever be interested in a lowly servant girl that even her stepsisters call "Cinders-ela"? WHAT I LIKED: As soon as I saw that Ms. Dickerson had a new fairytale spin-off published, I knew I'd HAVE to read it ASAP. After working my way through a waiting list for the Overdrive e-book at my local public library, I finally got the book at 3AM on the day after Christmas. Yippee! I downloaded it immediately and started reading. 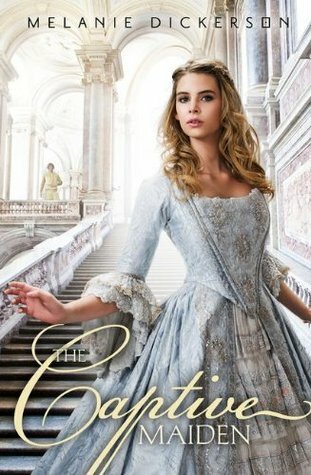 First, I had no idea that The Captive Maiden is a companion novel to The Fairest Beauty, which I absolutely adored. In The Fairest Beauty, Gabehart rescues his brother Valten's betrothed from her evil, jealous stepmother. Together Gabehart and Sophie escape to the Cottage of the Seven, where despite their efforts not to, Gabehart and Sophie fall in love. In The Captive Maiden, Valten finally gets his turn at romance after seeing a beautiful and courageous maiden dressed in rags at the market. He follows her and ends up intervening on her behalf when she is accosted by an unsavory man, who already has a grudge against Valten. Another thing I really liked is Gisela's determination not to allow her current situation to take over her life. Unlike the Disney Cinderella, Gisela defies her stepmother and fights back frequently. She has money saved and a plan to leave whenever she decides she can't take anymore. She does not wait passively for her prince to come and rescue her--she plans to rescue herself. When things get rough for Gisela and Valten, Gisela again takes an active role in their rescue. Some will like that this story is squeaky clean. For me, it's a bit Mary Sue (more on that in a minute), but librarians/teachers/parents looking for clean romances for their middle school girls will be hard-pressed to find anything morally objectionable in The Captive Maiden. WHAT I DIDN'T LIKE: Both Valten and Gisela are so "Mary Sue" that I found them not believable. While they may have been tempted to do something scandalous--ooh, no kissing!--they ALWAYS end up doing the "right" thing. The bad guy hurts them over and over and over, yet Gisela actually pities him. Valten, a knight perfectly within his right to dispatch the bad guy holding them hostage, never even thinks about killing him. I understand why Gisela, at the mercy of her stepfamily, has never kissed anyone at age 17. There are plenty of beautiful girls in our own time who at age 17, have never been kissed. But Valten is 24-years old, devastatingly handsome, supremely wealthy, and totally free to do as he pleases. Unlike Gisela, Valten has lost his way a bit where his faith is concerned, so there is no moral reason he would not kiss a girl. But I am expected to believe he has never kissed anyone before. Seriously? Also, The Captive Maiden--especially the first half--reminded me a lot of Drew Barrymore's 1998 movie Ever After. While I enjoyed that movie, this was too close to the plot. I dare you to read The Captive Maiden and NOT think of Ever After or picture Drew Barrymore as Gisela. It can't be done. The first half wasn't nearly as interesting as the second half. The jousting scenes went on too long for me, and I found myself skimming. Yeah, yeah, yeah, perfect, noble Valten fights fairly and wins every. single. time. I get it. Let's move on, please. THE BOTTOM LINE: The Captive Maiden is not as good as The Fairest Beauty, but Dickerson fans will enjoy it all the same. A very sweet romance with lots of chivalry, a sweet romance, and pretty dresses. STATUS IN MY LIBRARY: On order. I have recommended The Fairest Beauty plenty, and this one will no doubt be popular in my library. Fairytale retellings are arguably the hottest genre in my library right now, especially with the girls. Librarians concerned about sexual content and language in YA fiction have nothing to worry about with this book.